Pupil Premium is an allocation of funding that is given to us by the government to support children who may be vulnerable to under-achievement. The amount we receive is based on the number of children that we have who are entitled to Free School Meals (FSM) or who are ‘Children in Care’ (CIC). We receive the equivalent of £1320 for every child who is currently in receipt of Free School Meals plus some additional funding that is based on the number of children who have had Free School Meals in the past 6 years but are no longer eligible. 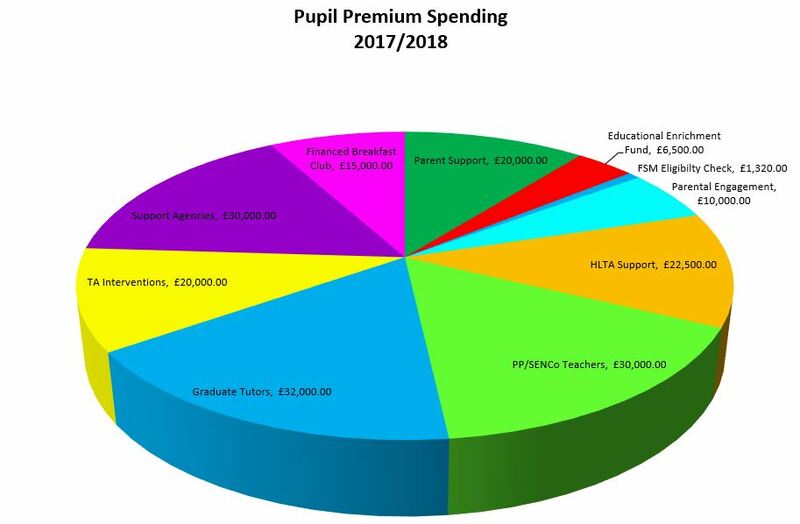 As a school, we have a responsibility to report on the progress of children receiving pupil premium; demonstrate how we are using the Pupil Premium Grant (PPG) and the impact that it is having on children from disadvantaged backgrounds. What do we use this money for? Key Focus 1: Parental Engagement – running organised events and informative workshops for parents in all key stages, and offering various resources to use at home alongside the child. Key Focus 2: Support for Language, Reading and Mathematics – ensuring opportunities are available in school for children to achieve the best they possibly can in all academic areas. Key Focus 3: Emotional Wellbeing – providing opportunities to further enhance children’s emotional happiness. This includes allocating some of the money to fund some specialist services so that we can offer our children and their families support far more quickly and without the long delays and paperwork that can occur when we refer to other agencies. Speech and Language Therapists assess children whose speech and language skills are causing concern and provide regular targeted intervention through speech and language programmes for individual children. Here at Gray's, we recognise that for many children this is a serious barrier to making progress and so we pay for a speech and language therapist to come to the school one day a week. She then works closely with the Teaching Assistants who work with these children daily to ensure that these programmes have maximum impact. Our School Counsellor works with individual children who may be experiencing anxiety, coping with bereavement or family separation. This helps them to become more emotionally secure and thus focus on their learning. We also have a play therapist who works with some of the younger children on a weekly basis, supporting them in becoming more emotionally secure. Evidence suggests that children who have eaten a healthy breakfast prior to the school day have greater concentration, and as a result perform better. With this in mind, as a trial, we are offering 17 children, with low attendance from Year 6, the opportunity to attend breakfast club (financed by the school) every morning to help improve their attendance and therefore increase their overall progress and attainment, by ensuring the best possible start to the day. Our Teaching Assistants are a valuable resource at Gray’s Farm and help to support the children’s learning in class and through planned, focused interventions outside of the classroom. They undergo regular training to ensure that they are conducting effective interventions that engage the children and support their progress in reading, writing and maths. These interventions are overseen and planned alongside class teachers to guarantee that they are tailored to directly support the individual child’s maths and English targets. Graduate Tutors & Additional Pupil Premium Teachers. 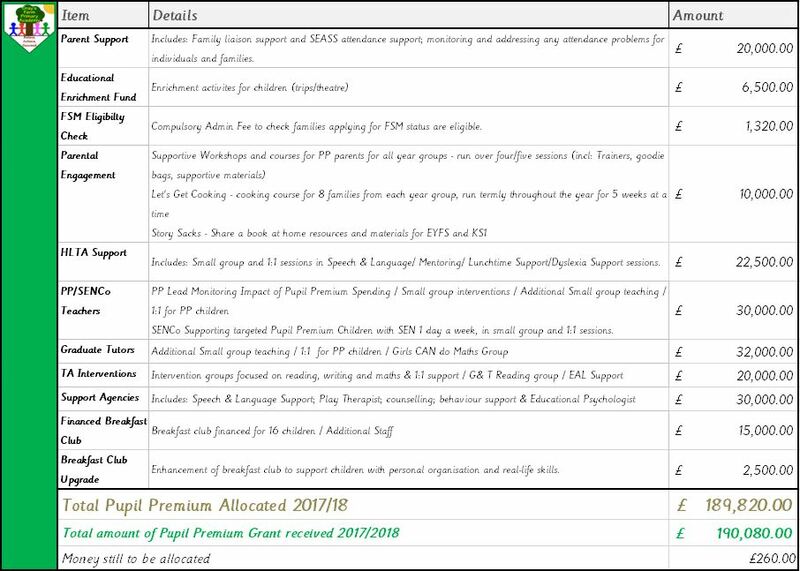 To ensure that the gap continues to close, we have allocated money this year for graduate tutors and qualified teachers to support pupil premium children within and outside of the classroom; in small group or 1:1 sessions. These sessions are planned for and tailored to each individual child, focusing on their barriers to learning and how these can be overcome quickly and effectively. Impact: How is The Pupil Premium helping? Enabled pupils eligible for pupil premium to access the same learning opportunities as other pupils. Aided our pupil premium children in making progress in Reading, Writing and Mathematics that was in-line with or, in some year groups, better than their peers, resulting in the attainment gap decreasing. In some year groups, children eligible for pupil premium funding made significantly more than expected progress across the academic year. Was matched to individual children/groups and then progress of each was tracked meaning the impact of interventions was measured more accurately and improved where necessary to ensure rapid progress was being made by children. Provided opportunities for parents to attend workshops that empowered them to support their children at home in all three core subjects. Provided 10 financed places at Breakfast Club to eligible children with low attendance or a high percentage of late marks in an attempt to improve their overall attendance at school, and therefore, increasing their academic attainment.